"A hearing person really can't understand how you could be happy if your child is born deaf, because everyone they know is hearing." Chances are if you are a person who can hear, the world of the deaf culture is probably something that is virtually unknown to you, unless you have had someone close to you that has lost their hearing. As someone who can hear, it is extremely difficult for me to imagine a completely silent world, and at one time in my life I would have considered that fate to have been nothing short of having been cast into a completely isolated existence. For the past few years my wife has been working as a deaf interpreter in a grade school, and her experiences have revealed to me not only the natural adaptiveness, but the fierce pride that connects those in the deaf community. Like any group or culture, there is a strata within, where those with partial hearing are almost the outcasts, while those born without hearing are considered the true deaf. There are those who believe that the use of sign language should be the preferred method of communication for those with hearing loss, while others recommend that the deaf learn a spoken and written language so they can be mainstreamed within the hearing world. Josh Aronson's thought-provoking Sound And Fury, a 2000 Academy® award nominee for best documentary feature, addresses the question of whether or not a controversial surgical procedure that could possibly produce some level of hearing in the deaf should be used. The procedure, developed in 1985, is a cochlear implant, an electronic device designed to stimulate hearing. It is not a 100% cure by any means, and it does require extensive speech therapy and auditory training. What it really appears to do is to create more dissension among those not only in the deaf culture, but in the hearing world, as well. 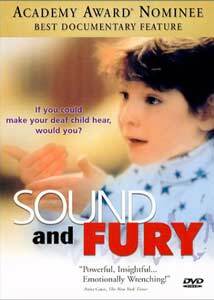 The film's tagline sums it up succinctly: "If you could make your deaf child hear, would you?" That question, which is not nearly as simple as it sounds, is the core of Aronson's film, and as subjects he uses the Artinians, a New York family deeply immersed in the culture. On one side there is Peter and Nita Artinian, a married couple, both of whom were born deaf. The pair have three small children, all deaf, with the oldest being five-year-old Heather. Heather desperately wants a cochlear implant so she can hear "birds sing and cars crash." Peter, a computer programmer, was the only deaf child in his family, and does not look upon his deafness as a handicap, or something that needs to be changed. Both Peter and Nita, as well as their children, use sign language as their primary method of communication. The other viewpoint of Aronson's film focuses on Peter's brother Chris, and his wife Mari. As a hearing couple, Chris and Mari are devastated when one of their twin sons is born deaf. Their desire to proceed with cochlear implant for their son is looked upon in a completely different light than that of Peter and Nita, and the subsequent family conflict that erupts reaches far beyond simple family bonds into the area of cultural uniqueness and individuality. The intense debates captured by Aronson as the Artinian family, as well as their extended group of grandparents, struggle loudly and vocally (even with sign language) with the deep-rooted emotional issues involved in the discussion and implementation of cochlear implants are eye-opening and heartfelt. Is it, like Peter says, a device that turns people into "robots" and threatens to destroy the deaf community, or is it a miracle of technology that can allow those without hearing to be part of the hearing world? Aronson doesn't preach too heavily one way or the other, and that even-handed approach gives his film a degree of fairness that leaves the answer to the question split down the middle. The bridge between the tight-knit and proud deaf culture and that of the hearing world is where Sound And Fury plants itself, and it requires the viewer to make their own decisions on what is right and what is wrong. Sound And Fury will air on PBS on January 8, 2002 at 9 pm ET. Image Transfer Review: A straight-forward 1.33:1 fullframe transfer for Aronson's film does not limit its impact at all. While some of the interview footage looks better than others, much of that is based on the actual location. Some of the staged interview shots feature more contrasted lighting, while the dramatically explosive outdoor barbecue footage has more of a natural, documentary look to it. Colors are warm and lifelike, though obviously not to the degree of a big-budget feature film. The subject matter is so compelling that the image transfer is almost secondary. Audio Transfer Review: Sound And Fury features a clean 2-channel Dolby Stereo mix, in English. The voiceovers for the translated sign language is very clear and distortion free. Aronson incorporates a number of different voiceover readers that speak the dialogue signed by some of the film's subjects, and their readings are expressive and effusive, and the audio mix doesn't hamper that in any way. There isn't much in the way of fancy-schmancy rear channel effects, but that's not surprising considering this is a documentary. Extras Review: In addition to a set of Docurama trailers (Sound And Fury, Regret To Inform, Speaking In Strings, Paul Taylor: Dancemaker, Bob Dylan: Don't Look Back, Fastpitch) and 12 chapter stops, there is a twenty minute collection of deleted footage that didn't make the final print. Some are extended versions of segments already in the film, while some feature interviews with other deaf individuals, including a young man who was the second person to receive a cochlear implant in the United States, and a teacher with the implant. I imagine that this footage will spark further discussion at your home, as did at mine. Considering the subject matter, the glaring absence of subtitles seems like a big mistake, though. I value the decision of a filmmaker to let me explore my own thoughts on a particular subject, and Josh Aronson's Sound And Fury will force you to think and wrestle with what is right, when it comes to the controversy that is cochlear implants. You can't ask for a documentary to do much more than that.